Four drills continue to be deployed at Rincón del Caído, with a fifth expected to be added in the coming weeks. 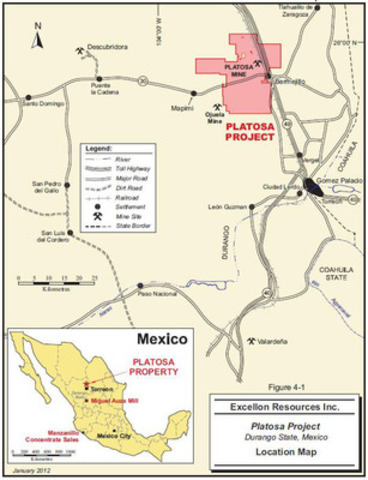 TORONTO, Nov. 15, 2012 /CNW/ - Excellon Resources Inc. (TSX: EXN) ("Excellon" or "the Company"), Mexico's highest grade silver producer, is pleased to report results for diamond drill holes EX12LP1028 and LP1030 drilled in the Rincón del Caído ("Rincón") area, 1 km northwest of the Platosa Mine. Both holes encountered significant sulphide mineralization within "Source"-type geology. The holes are step-outs from discovery-drill hole LP1019 (see press releases dated July 9 and October 24, 2012). To date, eight holes have now encountered very encouraging results within a growing irregularly shaped area roughly 90 m from east to west and 60 m north to south that remains largely open. Drilling continues with four rigs and a fifth drill rig is expected to be added in the coming weeks. "The continued expansion of Source-style sulphide mineralization along with the high grades encountered in our most recent holes are very encouraging developments for Excellon," stated John Sullivan, Vice-President of Exploration. 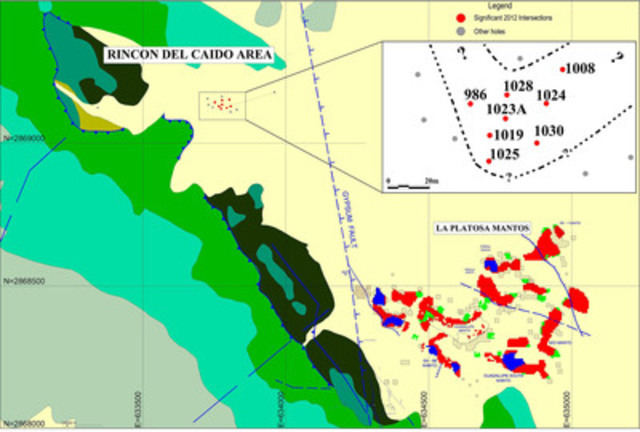 "The area between Rincón and the Platosa mantos remains open for the discovery of both the Source of the mantos and additional manto mineralization. We look forward to continuing and accelerating the search and expect to add a fifth rig to the program in the coming weeks." * Both holes were drilled vertical and intervals are core widths. Mineralization banding lies at highly variable angles to core axes in both holes (as is typical of skarn-related sulphide mineralization) and data points remain sparse. Further geometric information is required to estimate true thicknesses. The Rincón mineralization is developed in a marbleized limestone sequence located beneath the thick hornfelsed shale unit that underlies the dolomitized limestones hosting the Platosa Mantos (Map 3). Relatively pristine marble extends for tens of metres below the skarn and all holes bottom in high-silica, crowded granite porphyry containing small amounts of pyrite located at approximately 800 m vertical depth. Several of the sulphide intercepts surround pervasively sericitized felsic dykes. The orientation of the mineralized skarn cannot yet be determined, but the pattern of intersections suggests strong structural control. This control may be reflected by the numerous high-angle structures that cut the overlying rock units in all holes. These structures are being carefully sampled to determine if one of them was the pathway along which mineralizing fluids escaped from beneath the hornfels into the upper, manto-hosting limestone units. 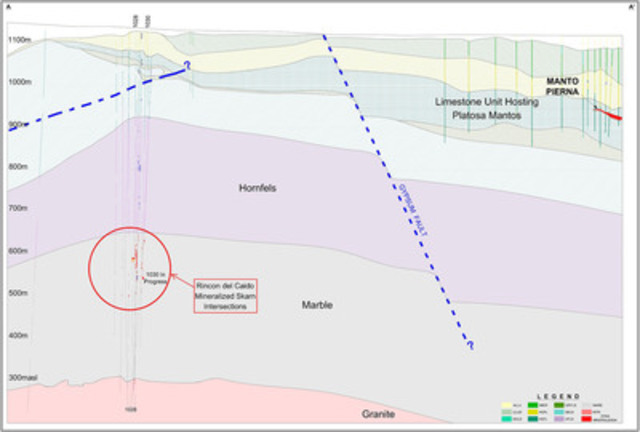 The downhole geophysical survey intended to gather orientation data to guide further drilling has been completed and the Company expects to have preliminary results later in the month. Since the exploration press release dated October 24, 2012, four holes in addition to LP1028 and LP1030 have been drilled at Rincón. Holes LP1026, LP1027A and LP1029 encountered only minor sulphides, but do not close off the area. Hole LP1032 was abandoned prior to reaching target depth because of technical problems. The Company's exploration programs are supervised by John Sullivan, Excellon's Vice-President of Exploration and he has acted as the Qualified Person, as defined in National Instrument 43-101 ("NI 43-101"), for this disclosure.